The Policy applies to all personal information collected by Billets.ca. This personal information is collected from the Website www.2tickets.ca (the “site”) and also through any other communication you may have with Billets.ca by e-mail, by mail or otherwise (including via social networks such as Facebook), about the tickets sold through the site. The Policy also applies to certain information gathered from our partners which is necessary for the provision of our services or when you have consented to such sharing of information. The Policy is subject to the An Act respecting the protection of personal information in the private sector, as well as other applicable legislation and regulations. Indeed, the member may, at his/hersole discretion, determine who his/her favourite artists are by accessing to the section “My preferences” of the site. The member’s identification of his/her favourite artists only aims at enhancing his/her experience of the site and allows Billets.ca to send him customized alerts. The data collected is not shared or sold to third parties. The transmission of alerts to the member presents several advantages. In fact, these alerts will be sent by Billets.ca to the member to inform him of the upcoming event of his/her favourite artist within his/her geographic area or to offer him special promotions for this artist. To benefit from these alerts, the member must provide his/her e-mail address and, optionally his/her phone or cell phone number, and ensure that this information is, to his/her knowledge, true and accurate. The member acknowledges that fees may be charged by the Internet service provider or the cell phone service provider to receive these alerts. Billets.ca cannot be held responsible for fees incurred by the reception of alerts or for any unwanted message. In the event that a member receives unwanted messages, he may unsubscribe by following the link provided in the email transmitted, text on his/her cell phone the word “unsubscribe”, or contact the customer service to remove his/her coordinates from Billets.ca mailing list. This information is mandatory and necessary to confirm your identity and the eligibility of your tickets to the 100% warranty provided by Billets.ca. It is possible that we collect information that is not private, particularly the type of Internet server or computer system you use or the domain name of the website from which you have reached ours. This information is used for statistical purposes, to give us a portrait of the average user using our site or the services of Billets.ca, and is not use to identify any users of the site. This information may include the type of Internet browser you use, the language of your browser, the time spent on the site, the pages visited, the artists searched, the type of device used, you IP address, as well as the calls made and other interactions with our customer service. It is possible that Billets.ca links the information obtained to your personal information when you log on the site. Moreover, we inform you that a cookie may be introduced on your computer if you access to our site by a banner placed on a partner website. This cookie is used to identify the site which has brought you to Billets.ca and, in case of a sale, identify the partner who has initiated the sale. This cookie contains no personal information and does not identify you. Your information such as you surname, name, email, postal address, password or credit card number are not recorded by this cookie or any other cookie used on our site. This ensures the security of the confidential information that you entrust us. 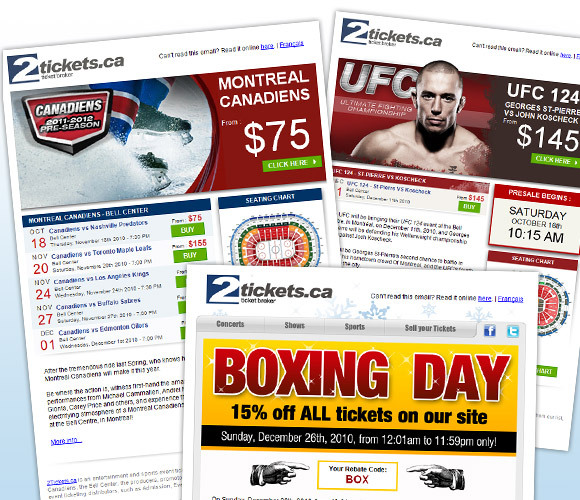 Please note that some messages are sent to you as required by Billets.ca since these are meant to inform you of a mandatory action to take, the critical state of a sell of tickets in the account, the status of an issue in which you are involved or the need for a member of our customer service to contact you. It is impossible to proceed to the manual configuration of these messages given their critical aspect or their highly significance. All the data are stored on servers of high security, protected against access by unauthorized persons and misuse. Billets.ca also protects the personal information disclosed to third parties in accordance with this policy in order to preserve the privacy and the purpose for which it was collected. Only individuals (employees or agents) who require the information in the course of their duties may have access. Billets.ca retains personal information for a reasonable period of time to achieve the objectives established or pursuant to the law, depending on which delay is longer. We establish retention criteria depending on the type of information collected. Email addresses or other personal information about your friends provided to invite them to become members of the site, to participate to a promotion or to refer a page of our site, as the case may be, are not subject to collection and are not kept by Billets.ca, unless they provide their personal information themselves and agree to receive communications from us. Our site is not intended for persons under 18 years of age. Billets.ca does not knowingly collect any personal information from such individuals. Our site may contain links to websites operated by other companies. By clicking on these links, you leave the site. Billets.ca has no control over the operation of these websites and the fact that they are listed on our site does not incur any liability for Billets.ca. All personal information that you submit through these sites is subject to their personal information protection policy and Billets.ca does not assume any obligation in this regard. From time to time, Billets.ca may change this policy. Please check it periodically. Any change will be notified to members by email and an appropriate notice will also be posted at the beginning of this policy.